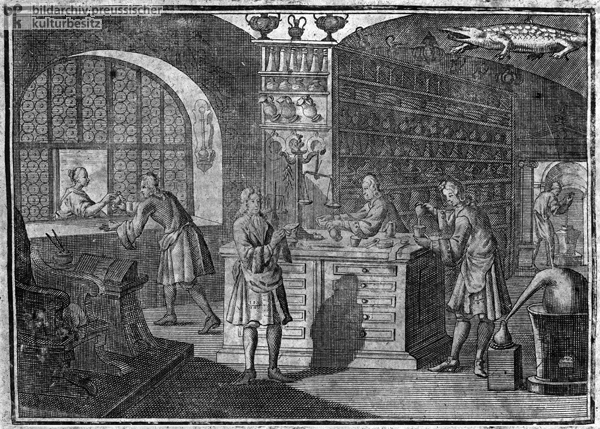 As early as the Middle Ages, apothecaries had risen from peddlers who sold cures and spices to wealthy patricians who produced their own medications. This illustration shows medications being prepared and dispensed at an apothecary. In addition to preparing medications, seventeenth- and eighteenth-century German apothecaries also made significant contributions to pharmaceutical research, thanks to their improved knowledge of chemistry. Berlin, Thuringia, and Saxony became centers of pharmaceutical research and teaching. Copperplate engraving by an unknown artist published in the 1750 edition of Franz Philipp Florinus, Oeconomus prudens et legalis. Oder Der kluge und rechtsverständige Haus-Vater [Oeconomus prudens et legalis. Or the Generally Prudent and Judicious Housemaster].